Details: KÄO centre for children offers services for children with severe mental and multiple disabilities. Volunteer will be assisting teachers during various activities and workshops done together with the children. 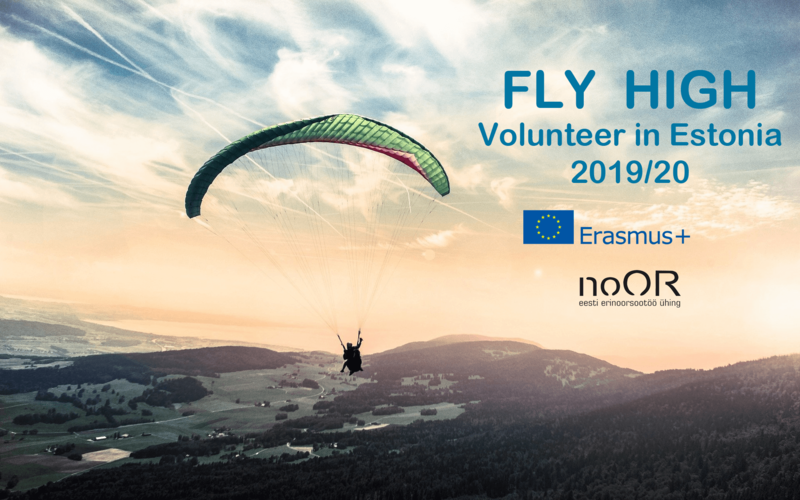 Previous experience with the target group is not requiered, but volunteers should be ready to work with special kids – 9 months, starting October 2019 untill July 2020. Preferred profile of the volunteer: Volunteer should be motivated to work with people with severe disabilities. Volunteer should have sense of self initiative and be proactive, also volunteer should be emphatic, calm, patience and with good routine tolerance. Basic English is required. Details: KÄO centre for adults offers services for people living with mental and multiple disabilities. Volunteer will be assisting teachers during various activities and workshops done together with the clients. Volunteer has the opportunity to offer her/his own activities for the clients – 9 months, starting October 2019 until July 2020. Preferred profile of the volunteer: Volunteer should be motivated to work with people with severe disabilities. Volunteers should be able to think independently, have sense of responsibility and be with calm nature. Basic English is required. Details: JUKS offers services for people with intellectual and learning disabilities. Volunteer will be assisting teachers during various activities and is welcome to initiate her/his own workshops – 9 months, starting September 2019 until June 2020. Preferred profile of the volunteer: Volunteers should be motivated to work with people with disabilities. Open minded and accepting. It would be good if she/he has previous experiences in the field but it is not determining facto in the application process. Volunteer should have sense of self initiative and be proactive. Juks is a big centre hence flexibility helps volunteers to adjust with the work culture. Basic English is required. Details: TPIK is an umbrella organisation for various organisations that work for or with people with disabilities. Volunteer will work in TPIK’s activity centre where they can create various workshops in order to create participation opportunities for people. Assist people during the activities. Give English and their home langugae converstation classes. Assist workers of the centre in various activities. TPIK has 22 member organisations sometimes they also have activities where volunteer can assist – 9 months, starting September 2019 until June 2020. Preferred profile of the volunteer: Volunteer should be motivated to work with people with disabilities. Volunteer should be proactive and with the sense of empathy. Good communication skills are an asset and some interesteing hobby which volunteers can easily turn into a workshop is also a good thing. Basic English is required. Details: Volunteers will assist teachers in the class with students living with special needs. Volunteer should be ready to run activities with students with special needs. – 9 months long service – starting September 2018 until June 2019. Preferred profile of the volunteer: Kadaka Basic school is Russian speaking school hence the volunteer should be ready to learn the language. Also be ready to work with the teachers and students. Basic English or Russian is required. Details: Muumipere kindergarten has over 50 children in ages of 1 – 3. Volunteer will assist teacher in her daily activities with the children – 10 months long service, starting September 2019 until July 2020. Preferred profile of the volunteer: Volunteer is expected to be polite and caring, they should understand that even if volunteer do not perceive her/himself as such, the children will see them as a role model. Volunteer should be social and ready to communicate with children even without knowing local language in this sense knowing English or Estonian is an asset but not necessarily needed. It is an asset when volunteer has a skill (play music, dance, etc) to teach or do together with children. Details: Mutionu kindergarten has over 50 children in the age of 2 – 6. Volunteer works with children who are from 4 to 6 years old. Volunteer will assist teacher in her daily activities with the children – 9 months long service, starting September 2019 until June 2020. Preferred profile of the volunteer: Volunteer is expected to be polite and caring, they should understand that even if volunteer do not perceive her/himself as such, the children will see them as a role model. They should be active, positive and eager to learn. Volunteer should be social and ready to communicate with children even without knowing local language in this sense knowing English or Estonian is an asset but not necessarily needed. Details: Kiikhobu kindergarten has over 250 children in the age of 2 – 7. Volunteer works with children who are from 4 to 6 years old. Volunteer will assist teacher in her daily activities with the children – 9 months long service, starting September 2019 until June 2020. Preferred profile of the volunteer: Volunteer is expected to be open, creative, kid friendly who is ready to assist kids in their daily activities – eating, dressing -, but also in learnig activities. Volunteer should tolerate noise and unexpected situations. Basic English is requiered. Details: Muumipere kindergarten has over 250 children in the age of 2 – 7. Volunteer works with children who are from 4 to 6 years old. Volunteer will assist teacher in her daily activities with the children – 12 months long service, starting September 2019 until September 2020. Preferred profile of the volunteer: Volunteer is expected to be polite and caring, they should understand that even if volunteer do not perceive her/himself as such, the children will see them as a role model. It is easier for the volunteer if he/she has previous experience with children in mentioned age. Basic English is requiered. Details: Circus studio Folie is one the first circus schools in Estonia that initiated new circus workshops. Folie is offering aerial acrobatics, juggling, clowning and acrobatics workshops to youth in the age of 7 – 18. Volunteer will assist workshop leaders during the activities, creates warm up exercises for children and can run her/his own workshops – 11 months long service, starting August 2019 until July 2020. Preferred profile of the volunteer: any kind of previous contact with various circus skill – juggling, monocycle, stage decoration, acrobatics – or experience in performing arts is an asset but not decisive during the application process. Basic English skills are needed. Details: Vinger offers services for people with intellectual and learning disabilities. In the centre clients learn basic things like cooking, cleaning, etc.. Volunteer will be assisting clients with their daily activities and is welcome to initiate her/his own workshops – 10 months, starting September 2019 until July 2020. Preferred profile of the volunteer: Volunteer should be motivated to work with people with disabilities. It would be good if she/he has previous experiences in the field but it is not determining facto in the application process. Volunteer should have sense of self initiative and be proactive. Basic English is required. Details: Orphanage is catering various services for more than 15 children in the age of 2 – 18. Tudulinna is a very small community, volunteer should be ready to spend time in a small place with limited transport options. Volunteer will be assisting youth worker in the orphanage in the activities with children who are vulnerable and some of them also live with some disabilities – 9 months, starting September 2019 until June 2020. Preferred profile of the volunteer: Volunteer should be motivated to work with children. Be open minded and proactive. Any special skill – art and crafts, movie making, photography – is an asset but not decisive in the application process. Tudulinna is a very small community (200 inhabitants) therefore volunteer should be independent and ready to live alone. Previous work with children is an asset! Details: Kindergarten resides in a small community Jüri close to Tallinn. Kindergarten is quite big with 244 children (in the age 1 – 7). Volunteers will work with kindergarten teachers and assist them in daily activities with children – 10 months, starting September 2019 until July 2020. Preferred profile of the volunteer: Volunteers should tolerate noise and other pequliarietes related to small kids, like crying and weird smells. Volunteers should want spend time with kids, play with them and run various activities – spend time outside, hike etc. Basic English is requiered. Details: Keila is a small community close to Tallinn. Keila School is big school where many pupils attend. In the school volunteer will work with other teachers but also assist students in their school work – 10 months, 28th of August 2019 until 28th of June 2020. Preferred profile of the volunteer: Volunteer should be independent and ready to live in a small community. Should have good communication skills and strong sense of responsibility. Volunteers should eb interested in local culture, educational system and hold humanistic values. Details: Maidla is a small community in North-East Estonia. In Maidla youth center volunteer will assist local youth worker. Youth center has quite active group of youth coming to together and motivated to learn about cultures and also organise international youth projects – 10 months, September 2019 until July 2020. Details: Volunteer will work in Aruküla community, 25 km from Tallinn, kindergarten (children in the age of 3 – 7) and basic school (pupils in the age of7 – 16) running workshops and doing activities in the organisation – 12 months, September 2019 until July 2020. Preferred profile of the volunteer: Volunteer should be independent and ready to live in a small community. Should have good communication skills and strong sense of responsibility. Volunteer should like to organise activities and work with youth. Details: The Astangu Vocational Rehabilitation Center is a unique center in Estonia, offering various services based on clients needs, developing the field of rehabilitation in Estonia and sharing competences with other service providers. Our wide array of projects and developments combine with our main vocational rehabilitation process, constituting the prime activities of our center. – 9 months, starting September 2019 until July 2020. Preferred profile of the volunteer: Volunteers should be proactive and have a wish and will to work with people with special needs. Basic English is required. Details: Vääna-Viti Home offers services for people (adults) with intellectual and mental disabilities. Everyday we work for one goal- that people who live with us should have active and positive day no matter of their age, gender or disability. We are also very active in sports like walking, games, dancing, singing and activities like art and handicraft. We are always standing for disabled people´s rights to be involved in society and feel safe at home. We support every person to be as independent as they can. We concentrate in everyday activities which people in their homes are carrying out – cleaning, working in the kitchen, outside in the garden, where in summertime grow herbs, vegetables and flowers. We are guiding and teaching our clients how to carry on these activities on their own as much as their skills and disabilities are allowing. – 12 months, starting September 2019 until September 2020. Preferred profile of the volunteer: We expect that the volunteer is committed to the project, is independent and active, positive, open minded, flexible and willing to learn. Also active to support our clients in everyday activities – working activities, hobbies and also to be ready to give suggestions to improvement of our service. Some experience in work with people with special needs would be an advantage. Positive way of life – friendliness and sociability are the characteristics that describe a successful volunteer candidate. We also expect the candidate to be reliable, responsible and taking initiative. Previous experience in working with people with disabilities is an asset but necessary. Volunteers should be ready to live in a small community (30 min bus ride from Tallinn). Details: Tapa Home offers services for people (adults) with intellectual and mental disabilities. Everyday we work for one goal- that people who live with us should have active and positive day no matter of their age, gender or disability. We are also very active in sports like walking, games, dancing, singing and activities like art and handicraft. We are always standing for disabled people´s rights to be involved in society and feel safe at home. We support every person to be as independent as they can. We concentrate in everyday activities which people in their homes are carrying out – cleaning, working in the kitchen, outside in the garden, where in summertime grow herbs, vegetables and flowers. We are guiding and teaching our clients how to carry on these activities on their own as much as their skills and disabilities are allowing. – 12 months, starting September 2019 until September 2020. Preferred profile of the volunteer: We expect that the volunteer is committed to the project, is independent and active, positive, open minded, flexible and willing to learn. Also active to support our clients in everyday activities – working activities, hobbies and also to be ready to give suggestions to improvement of our service. Some experience in work with people with special needs would be an advantage. Positive way of life – friendliness and sociability are the characteristics that describe a successful volunteer candidate. We also expect the candidate to be reliable, responsible and taking initiative. Previous experience in working with people with disabilities is an asset but necessary. Details: Rakvere Home offers services for people (adults) with intellectual and mental disabilities. Everyday we work for one goal- that people who live with us should have active and positive day no matter of their age, gender or disability. We are also very active in sports like walking, games, dancing, singing and activities like art and handicraft. We are always standing for disabled people´s rights to be involved in society and feel safe at home. We support every person to be as independent as they can. We concentrate in everyday activities which people in their homes are carrying out – cleaning, working in the kitchen, outside in the garden, where in summertime grow herbs, vegetables and flowers. We are guiding and teaching our clients how to carry on these activities on their own as much as their skills and disabilities are allowing. – 12 months, starting September 2019 until September 2020. Details: Kehra Home offers services for people (adults) with intellectual and mental disabilities. Everyday we work for one goal- that people who live with us should have active and positive day no matter of their age, gender or disability. We are also very active in sports like walking, games, dancing, singing and activities like art and handicraft. We are always standing for disabled people´s rights to be involved in society and feel safe at home. We support every person to be as independent as they can. We concentrate in everyday activities which people in their homes are carrying out – cleaning, working in the kitchen, outside in the garden, where in summertime grow herbs, vegetables and flowers. We are guiding and teaching our clients how to carry on these activities on their own as much as their skills and disabilities are allowing. – 12 months, starting September 2019 until September 2020.